– If you think too much is lost just for releasing on a particular date, maybe better release it later. The first impression is often the one that counts for most people (that have not played the game in the past). The date has big significance in the game lore, but past the release date, it will not. This release is not for new-comers. If I was worrying about that, this release would not be happening at all, this is not the version of the game that Mike and I intended to attract new players. This is about getting LoM and Dr out on new devices as a tribute to Mike and nothing else. I will draw a line under the two midnight games, and then leave me more time to consider the implications of further release to attempt to achieve the goals that we originally set ourselves. The reason for the redrawn graphics is because Mike and I would not release the game with the original graphics, and this is the best compromise. When you look at the game, you will see the original game. We do have a version of the graphics coloured differently, and I may make that available as a optional theme. We are also keen on looking at the style of graphics that I originally intended for my Windows versions of Doomdark’s Revenge. Again these might appear later. Excellent Chris. Really looking fwd to this!!! Thanks for the update, cannot wait for the release for iPad. Well done Chris. I am looking forward to this and have enjoyed having the opportunity to help test the iPad version. I also have an android phone so happy to do testing on that if required. I get this good, warm and fuzzy feeling with every of your updates on the games – damn, I look forward to them! So sweet to read that you are progressing! Wow, Christmas is coming! There is a 14 year old boy in me that believes that you are the real Santa Clause Chris! I can’t wait to try LoM and DR again. I hope the gaming public reward you with the kind of adulation that your work of love deserves. Great news Chris. I echo the previous comments about looking forward even more to Xmas now! Very good news that the tribute version will be out soon. The screen shot is so inviting … I remember my wife and me plotting a huge map on squared paper as we played the original game. Can’t wait, and thankyou. Don’t knock yourself out Chris, It’s been a hard few months to cope with. Mike, the house move, LOM. Diehard LOM gamers will wait, new ones don’t know what their missing. Put your feet up, enjoy Christmas in your new place. Raise a glass or three to Mike and come out fighting in the New Year. Ha, I so agree with Rob’s comments at 1:20. I am not sure if it was LOM or DDR revenge I had one Christmas, but it completely swallowed up days on end. I always find it amazing how games on a mere 48K had so much more playability then 90% of anything ever released these days. Look forward to playing it again. Had to visit the blog on my iPad just to see how the loading screen image would look. Looks great. Very happy with the look of the art, higher rez but looks like the original art from a distance. While this is a tribute to Mike and the original game, I think it looks unique enough to draw in new players. Chris, been looking a lot recently at KS and have backed probably more than I should. I think Jan 2013 – UK KS Projects of classic games are going to POUR out. The comments page for Elite:Dangerous is like a bulletin board! I know it’s not about the money of doing the work and to be fair, never having met the man, when I heard about Mike’s passing away – I was utterly despondent and text my brother similar – the Ice Fear, as you well stated was very cold. I honestly think the money is there and also is the desire and want from the older gaming community. 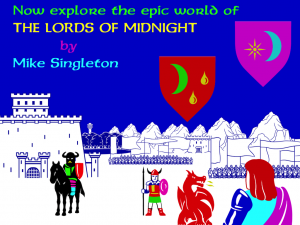 Lords of Midnight Online / Multiplayer is something I’ve wished for for one score years (near enough!). Hope you have the drive to make these things happen, if they are in any way achievable. Can’t help but think that many of these Kickstarter games are a sham… already funded to a tune, and all about pre-sales and advertising. I don’t believe Some of these games can be funded for the relatively small amounts they are asking for. Also neither Mike or I liked the rewards process… it jars that you have to fund your own reward… i.e. : How much of your pledge is actually going to development? I last checked out MidnightMU ages ago – it looks much better now. And I have to agree – these developers could so fund the games themselves. The success of Star Citizen is going to be a one-off! Cannot wait to play iOS LoM! I was a huge fan of LoM and DDR in my youth (and I’ve been an occasional visitor to your site for over ten years), and continued playing them via the PC versions that came with The Citadel long after my Spectrum ceased to function. I’m sorry to hear Mike Singleton has passed away. However, I’m glad you have continued with the project. I am sure that as Mike was glad to collaborate with you on the project, he trusted you to do well by it. I would certainly enjoy seeing you continue it through to the last of the trilogy too, in a form very much of the spirit of the first two rather than the 3D form it was produced in. Good luck!